This trail combines exciting single and double track trails coupled with scenery, wildlife, and a roller coaster finish. 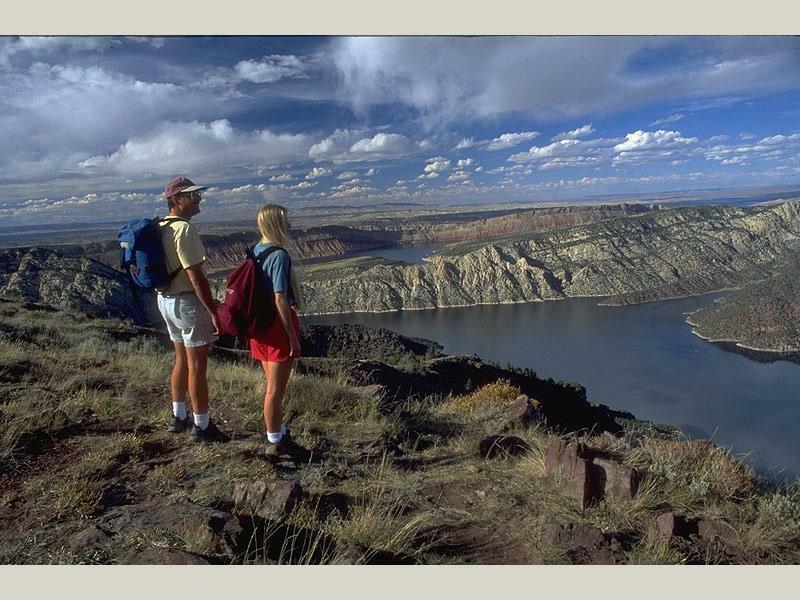 The Dowd Mountain trail leads to a breathtaking over look of Flaming Gorge, including views of the western portion of the lake. On a clear day, the horizon extends well into Wyoming. 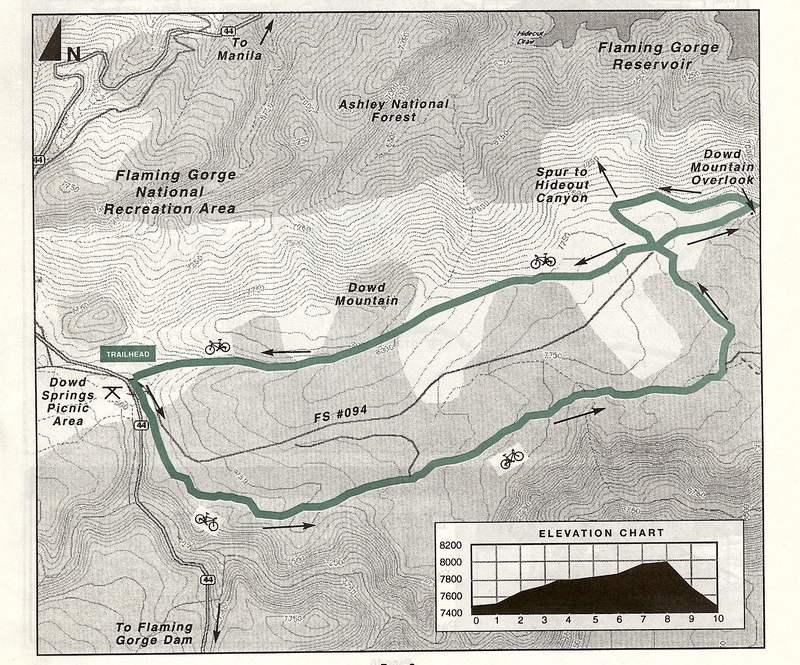 The route follows a trail of blue diamonds placed by the Forest Service and is regularly maintained. Dowd Mountain Overlook has restrooms, interpretive signs and is a great place for a picnic. Recreation Fee Pass required. For more information, call the US Forest Service, Flaming Gorge Ranger District at (435) 784-3445. From Manila, travel south on UT44 to just before milepost 14. Park at the gate area. Begin pedaling up the Dowd Mountain Road. Cross over the cattle guard and take the single-track trail to the right marked by the carsonite post. The trail undulates among the pine trees for a few miles before merging with a double track road. Follow the blue diamonds along the main road past several branching routes. The trail eventually swings north and intersects FS 094. Go right (east) to the overlook 0.5 mile ahead. From the overlook, follow the Dowd Mountain Hideout trail to the north, following the trail along the hillside to an intersection. Go left up the hill to the 3-way intersection and proceed right (west) on FS 613. After abut a mile the trail reaches the saddle and splits. Head straight down the narrowing trail, over the roller coaster berms down the gully back to the trailhead. Thank you for visiting http://www.flaminggorgecountry.com/Dowd-Mountain! Be sure and revisit flaminggorgecountry.com frequently for content updates and more.